Shelby Foote was born on November 7, 1916 in Greenville, Mississippi, and attended school there until he entered the University of North Carolina. During World War II he served as a captain of field artillery but never saw combat. After World War II he worked briefly for the Associated Press in their New York bureau. In 1953 he moved to Memphis, where he lived for the remainder of his life.Foote was the author of six novels: Tournament, Follow Me Down, Love in a Dry Season, Shiloh, Jordan County, and September, September. He is best remembered for his 3-volume history The Civil War: A Narrative, which took twenty years to complete and resulted in his being a featured expert in Ken Burns' acclaimed Civil War documentary. Over the course of his writing career, Foote was also awarded three Guggenheim fellowships.Shelby Foote died in 2005 at the age of 88. New York: Dial Press, 1950. First edition of this Faulknerian novel by the author of the acclaimed trilogy The Civil War. Octavo, original cloth. Presentation copy, inscribed by the author on the front free endpaper, "Dorothy Abbott from Shelby Foote Memphis 30 Jan 81." Fine in a very good dust jacket with some wear and tear. 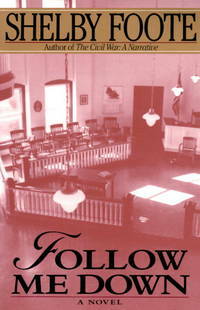 Follow Me Down is a mesmerizing novel of faith, passion, and murder by the author of The Civil War: A Narrative. Drawing on themes as old as the Bible, Foote's novel compels us to inhabit lives obsessed with sin and starving for redemption. New York: Dial Press, 1950. First Edition. Near Fine/Very Good+. First edition, first printing. Signed by the author on the title page and inscribed to a former owner. Bound in publisher's red cloth with titles stamped in blue on the spine. Near Fine, with light rubbing at tips. In a Very Good+ dust jacket with light fading to the spine, light edge wear and light soiling to the rear panel. A lovely copy. New York: Dial Press Inc.. Very Good in Good dust jacket. 1950. First Edition; First Printing. Hardcover. Very Good hardcover edition, signed by the author on the front endpaper. Dust jacket is wrapped for protection, but has some light chipping and edgewear. There is a previous owner's name on the inside of the front board. ; 8vo 8" - 9" tall; 271 pages; Signed by Author . New York: Dial Press, 1950. 1st Edition. Hardcover. Near fine/very good +. 1st Edition. Hardcover. Author's 2nd book, DJ price clipped, 1" closed tear junction lower front panel and front flap, 2" closed tear lower junction rear panel and rear flap, light soiling to rear panel. NY: DIAL.. Fine. 1950. First Edition. Hardcover. About fine in a close to fine dj. (Mild erasure on front pastedown underneath dj. flap. A few short edge nicks in dj. Hint of slight rubbing to dj.) Author's SECOND novel. A lovely copy. . Dial Pr, 1950 Old Price Marked Inside Front Cover, Else Unmarked. The front DJ has small tears on the top and bottom corners and a light stain about an inch long, half inch wide on the dead tree. The back cover is better except a tear about an inch and a half long on the top corner. New York: Dial Press, Inc, 1950. First Edition. Octavo. 271pp., bound in red cloth, spine lettering blue, in unclipped pictorial dust jacket with light edge wear, chipping to spine ends a few brown spots to rear panel, book leans a bit. Previous owner's name Ernestine Alberta Care who was the sister of Frank B Gilbreth who wrote "Cheaper by the Dozen." A good copy. 1993-04-09. New. Ships with Tracking Number! INTERNATIONAL WORLDWIDE Shipping available. Buy with confidence, excellent customer service! Hamish Hamilton, 1951. Book. Very Good. Hardcover. First Edition. Couple of small chips to top of jacket at spine. One-inch by quarter-inch chip to top of back panel near flap fold. A scarce title in the English edition.. Dial Press. Collectible - Good. 1950, stated 2nd printing, rust colored tweed type cloth, covers are lightly edgeworn, hinge is starting at p152, foxing spots to fore edge and foxing to eps, interior is clean and binding sound, dust jacket is edgeworn and chipped, dj spine and rear panel are browned. New York: Dial Press Inc., 1950. 272 pp. Original red cloth covers, lightly soiled w/ light discoloration to bottom edges. Spine a bit sunned; ends a bit frayed. Contents nice.. First Edition. Hard Cover. Very Good/No Dust Jacket. 8vo - over 7¾" - 9¾" tall. Random House. Hardcover. 0394408756 Like New Condition. . Fine. Random House. Hardcover. 0394408756 New Condition. . New. Westminster, Maryland, U.S.A.: Random House Inc, 1978. Hardcover. Fine/Fine. Second edition/First Printing 1978. A stunning fine unread copy in very fine condition in an unclipped ($8.95) and very good dustjacket--that is only slightly age toned. The front flap is lightly creased and there is a very small pink mark to the front cover--not covering any lettering. No tears or chips. The condition of the book is outstanding and more than makes up for the dustjacket--a very collectible copy. A remake of the original from the early 50's---but still collectible in it's own right. 1993-04-09. Good. Ships with Tracking Number! INTERNATIONAL WORLDWIDE Shipping available. May not contain Access Codes or Supplements. May be ex-library. Shipping & Handling by region. Buy with confidence, excellent customer service! Random House, 1978-07-12. Hardcover. Good. Vintage, 1993. Paperback. New. 7.99 x 5.15 cm. Random House. Hardcover. 0394408756 Remainder mark to top edge, minor thumbing, else tight and clean. DJ shows light yellowing, minor rubbing. A nice copy of the first. . Very Good. 1978. 1st Edition. Random House. Used - Good. Shows some signs of wear, and may have some markings on the inside. Random House Publishing Group, 1978. Hardcover. Good. Disclaimer:A copy that has been read, but remains in clean condition. All pages are intact, and the cover is intact. The spine may show signs of wear. Pages can include limited notes and highlighting, and the copy can include previous owner inscriptions. At ThriftBooks, our motto is: Read More, Spend Less.Dust jacket quality is not guaranteed. New York: Vintage Books, 1993. Softcover. Fine. First edition. Trade paperback. Fine. Please Note: This book has been transferred to Between the Covers from another database and might not be described to our usual standards. Please inquire for more detailed condition information. New York: Random House, 1978. Softcover. First edition. Fine in wrappers, an as new paperback copy. First edition. Pages very lightly tinted yellow. Clean text. Clean glossy cover. Please Note: This book has been transferred to Between the Covers from another database and might not be described to our usual standards. Please inquire for more detailed condition information. Vintage. PAPERBACK. 0679736174 . New. Vintage. PAPERBACK. 0679736174 Remainder mark . Fine. New York: Dial Press, Inc, 1950. first edition. Hardcover. Octavo; G/no-DJ; Tan spine with blue text; Cloth has moderately sunned spine with slight wear on front & back panels which have minor rubbing at corners and otherwise intact and sturdy; Text block shows slightly age toned exterior edges with tight binding and unmarked pages; pp 271. Shelved Rockville Bookstore. Vintage. PAPERBACK. 0679736174 Special order direct from the distributor . New. Vintage, July 1993. Trade Paperback. New. Vintage. PAPERBACK. 0679736174 *BRAND NEW* Ships Same Day or Next! . New. Vintage. PAPERBACK. 0679736174 *LIKE NEW* Ships Same Day or Next! . Fine. New York: Signet, 1951. Book. VG. Paperback. First Paperback Edition. A VG copy. Signet #860. First printing..
New York: Signet (#S1685), 1950. Book. Very Good+. Soft cover. 7/59 4th thus. No names, clean text. Fiction by the noted Civil War historian. very good+, mass market paper, pict. yellow covers, tight 191 pgs. New York, NY, U.S.A.: Vintage Books, 1993. Seventh Printing. Trade Paperback. Very Good. Brief summary of content available on request by e-mail. Vintage. PAPERBACK. 0679736174 Very nice book. Minor wear to cover edges and corners. Two small wrinkles on bottom of spine. . Very Good. Vintage. Used - Good. Shows some signs of wear, and may have some markings on the inside. Knopf Doubleday Publishing Group, 1993. Paperback. Acceptable. Disclaimer:A readable copy. All pages are intact, and the cover is intact. Pages can include considerable notes-in pen or highlighter-but the notes cannot obscure the text. An ex-library book and may have standard library stamps and/or stickers. Knopf Doubleday Publishing Group, 1993. Paperback. Acceptable. Disclaimer:A readable copy. All pages are intact, and the cover is intact. Pages can include considerable notes-in pen or highlighter-but the notes cannot obscure the text. Knopf Doubleday Publishing Group, 1993. Paperback. Very Good. Disclaimer:A copy that has been read, but remains in excellent condition. Pages are intact and are not marred by notes or highlighting, but may contain a neat previous owner name. The spine remains undamaged. An ex-library book and may have standard library stamps and/or stickers. At ThriftBooks, our motto is: Read More, Spend Less.Dust jacket quality is not guaranteed. Knopf Doubleday Publishing Group, 1993. Paperback. Very Good. Disclaimer:A copy that has been read, but remains in excellent condition. Pages are intact and are not marred by notes or highlighting, but may contain a neat previous owner name. The spine remains undamaged. At ThriftBooks, our motto is: Read More, Spend Less.Dust jacket quality is not guaranteed. Knopf Doubleday Publishing Group, 1993. Paperback. Good. Disclaimer:A copy that has been read, but remains in clean condition. All pages are intact, and the cover is intact. The spine may show signs of wear. Pages can include limited notes and highlighting, and the copy can include previous owner inscriptions. At ThriftBooks, our motto is: Read More, Spend Less.Dust jacket quality is not guaranteed. Knopf Doubleday Publishing Group, 1991. Trade Paperback. Very Good. Vintage. Paperback. GOOD. Spine creases, wear to binding and pages from reading. May contain limited notes, underlining or highlighting that does affect the text. Possible ex library copy, thatâll have the markings and stickers associated from the library. Accessories such as CD, codes, toys, may not be included.